I fell in love with this sampler right away, but like Terri, I did not like the called for colors. So I did my own tentative conversion. I say tentative because there are a couple colors I'm still unsure about and may not know how they will look until I start stitching. Well, I'm not sure when I'll actually get to this sampler, but it was fun playing in all the threads. Since it's been colder I've started drinking hot tea. I went to Pier One today and found a sweet little teapot on clearance. I've been trying many different teas lately and I've found a favorite... Twinings Irish Breakfast Tea. I'm going to enjoy seeing your conversion in action. I'll have to decide who to go begging to. lol! Haven't tried to pull the called for DMC yet. Sometime I will. Good luck! Love the teapot! 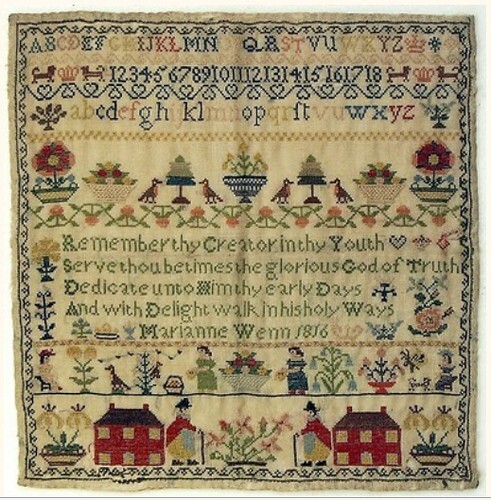 Another beautiful sampler for you!! Great color conversion, too. I've been enjoying having tea during the winter time. I found "Lady Grey" (Twining's) in last fall and it tastes wonderful :))) I will try Irish Breakfast, too! Your conversion choice are yummy...bet it will turn out beautifully! 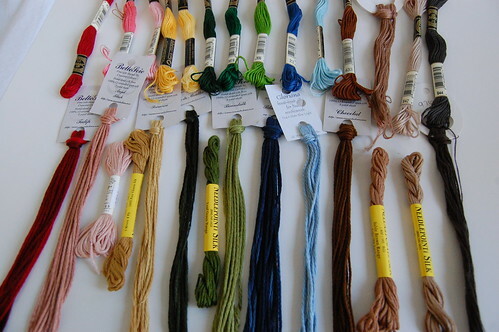 I also love silks, this sampler will be perfect with your choise of silks! Oh, you caved as well? So did I! I love your conversions and I can't wait to see your start and progress (and doubtlessly finish before I even get to pick up my fabric and floss). What a sweet little teapot! I definitely like the silks and overdyes much more. The DMC is really quite awful I think...Way to bright. I like this pattern as well. A little different with the little heavyset figures. Have fun stitching! Love your conversion, Nicole! I am pretty set on mine, just waiting for the new fabric - I sent back the Navy Bean and should have the new fabric this week. I can't wait to get started on her! Your teapot is darling - I'm an iced tea drinker year round. Just can't do hot tea but.... I love hot chocolate from Dunkin Donuts in the winter. Yum! 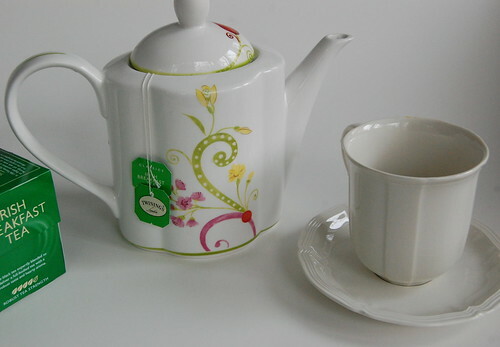 Cheerful teapot - it's very cute. That is my DD's favorite tea, also. I really Twinings' Lady Grey. I really like your more muted conversion. Really nice while keeping to the spirit of the original chart. I really like the conversion that you have come up with. Very nice. Irish Breakfast is my favorite tea, as well. Oh, I like that sampler, and I love seeing all the colorful photos on your blog today. Maybe it's because I've been stitching my monochrome (brown) sampler for a long time now, and I'm ready for some brighter colors. Recently took the advice of another stitcher to try Stash Pomegranate Raspberry tea. It's quite nice. I'll have to try the ones suggested by you and the others who commented. Thanks for sharing your tenative choices for the Marianne sampler. You sure must have a lot of colors of threads!. I have ordered the sampler, but haven't gotten it yet. Looks like a great conversion. Your teapot is so pretty! I like your silks a whole lot better! Can't wait to see when you stitch it! Thanks for sharing the conversion. Great teapot. I love teas now too! That is a lovely sampler! Your conversion in progress is very interesting! Ah, one of the great things about winter...hot tea! While you're in the trying mood, find some Oolong. Yummy!! Your conversion is so, so much better!!!! Oooh, beautiful!!! I want to stitch Marianne but it'll be awhile. I'll have to remember your conversion! Thanks for sharing it. I love your conversion and may use it myself. I have been having finding some substitutes for some colors that feel right. I enjoy a nice hot cup of green tea in the evenings. Your conversion is beautiful! And thanks for showing the original DMC, I was curious what they looked like. Hmm, Irish Breakfast Tea - I think I've only had English. I'll have to try it! Cute teapot! Nicole, I'm sure your conversion will be perfect! That is NOT a talent of mine, but I am certain it is because I have no patience. I can put countless stitches in a piece of fabric, but I have no patience for converting things. lol! I love your teapot!! I don't do too much hot tea, though I always enjoy it when I do just as long as it has cream and sugar in it. Pour me a cup! Isn't fun playing with the threads? You did a nice job picking the colors.